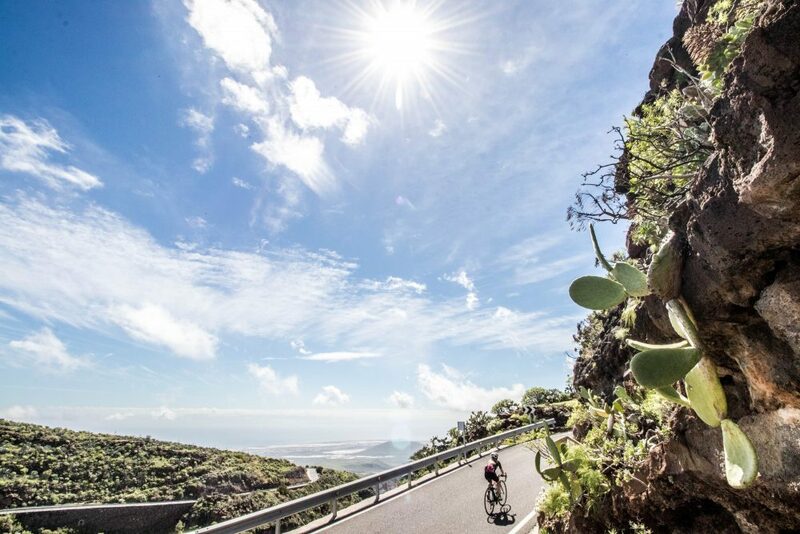 Both Gran Canaria and Tenerife are popular destinations for cyclists wanting to escape the winter blues in search of sun, sea and epic riding roads, and is it any wonder?! We’re often asked what the difference is between the two, so if you’re keen to find out, read on and we’ll endeavour to bring you up to speed. With average flight times of just over 4 hours from the UK, both destinations are readily accessible, with flights departing London, Manchester, Bristol, Edinburgh, and many more locations, making travel exceptionally easy. Touching down at the other end you’ll immediately notice the change in climate, with both islands enjoying average temperatures of between 17°C and 18°C for 8 hours per day in February, rising to 19°C in March; perfect cycling weather. Tenerife has gained notoriety in recent years for being where some of the biggest teams in professional road cycling ‘over winter’, making use of the seemingly never-ending roads up Mt Teide, and the ‘high altitude’ lodgings of the now famous Parador Hotel, nestled atop the crater at over 2000m. Being a volcanic island (don’t worry, it hasn’t erupted since 1909!) the scenery is understandably dramatic, with once-bubbling flows of lava and some decidedly moonlike landscapes. Drop down a few hundred metres and you’re riding through pine forest. Yet further on the pine makes way for cactus and succulents, such is the island’s proximity to Africa. With the ultimate summit of Teide being up at 3700m, the peak often attracts a halo of cloud, bringing a real element of drama to the place, but down at road level you’re usually in the clear. Gran Canaria, despite also being of volcanic origin, is quite different. What Tenerife lacks in terms of vegetation, Gran Canaria more than makes up for with its lush forested landscape of rolling mountainsides, towering rock formations (see Roque Nublo) fertile terraced farmland and thick forest. 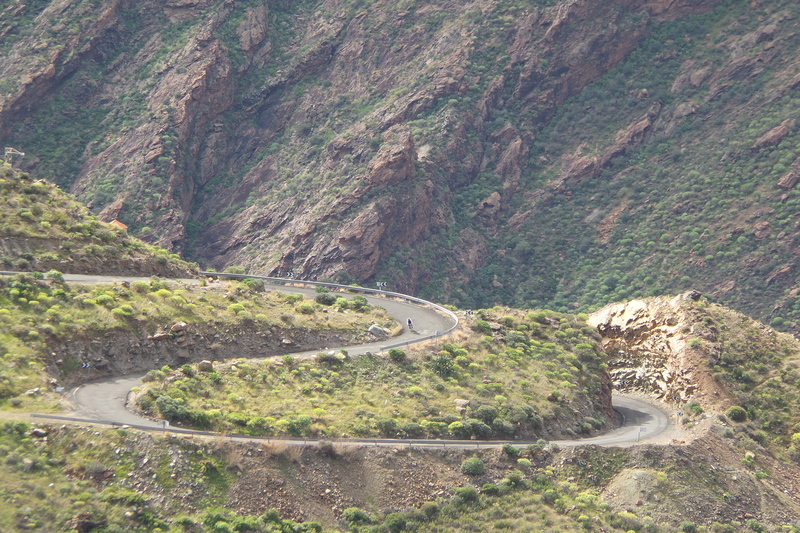 Often commented upon as being exceptionally green, Gran Canaria offers a far wider network of roads that twist and turn and snake their way all over the island, affording riders the opportunity to cycle in relative solitude, away from the inevitable tourist traffic that both islands draw. The quality of the roads in both locations can generally be classed as very good, with the majority of the roads we ride being smooth tarmac that rarely sees weather harsh enough to damage it. That being said, we explore both islands extensively and as a result stray onto some more ‘variable’ quality surfaces, so there is a strong argument to say that a larger volume tyre (25c and above) will be greatly appreciated, especially so on some of the more rural roads. To put your mind at ease, the pro’s happily train all winter long in both locations. We’d say the surfaces were, on the whole, just as good as any road in the Alps. 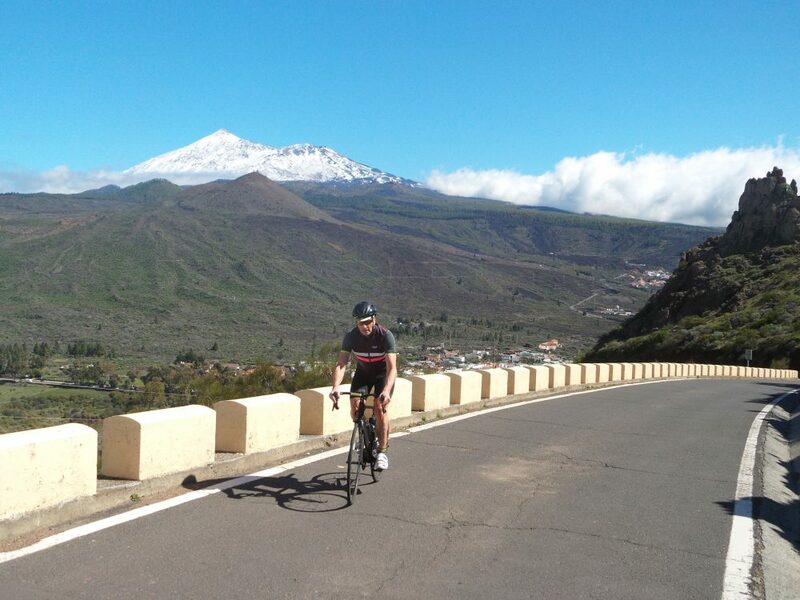 Whilst there are always ‘cheeky climbs’ to be found, it is fair to say that on average, Tenerife enjoys the shallower gradients of the two islands, all of which terminate at the famous Teide crater. Much like its wider network of roads, the gradients on Gran Canaria vary widely. On average you can expect to be riding gradients of around 5-8%, but there are certainly some sections that flirt with the 13-15% mark. Phew! So there you go. As ever, we’re at the end of a phone call or email if you’d like to check availability on any of our road cycling holidays to the Canaries. In 2019 we have guided cycling tours to Gran Canaria from 24th-31st January, 24th February-3rd March and 29th March-5th April. 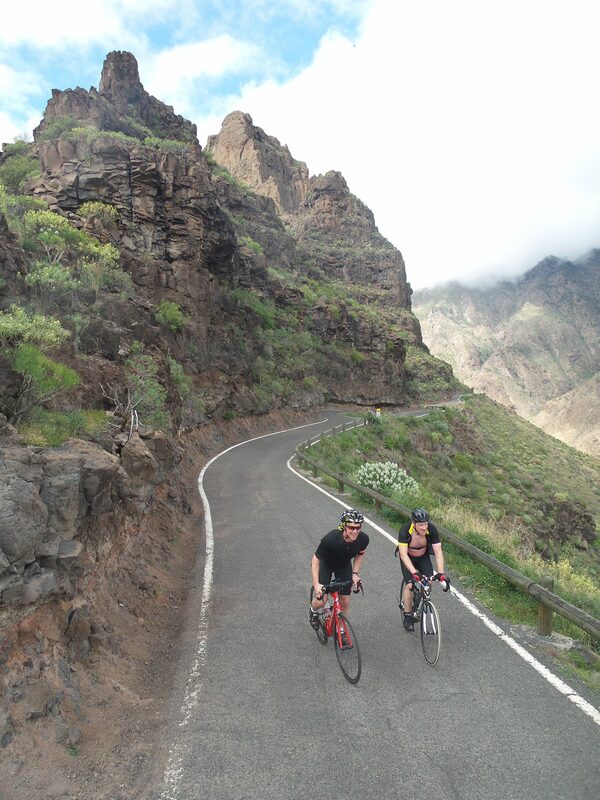 Our 2019 guided road cycling holidays to Tenerife run from 1st-8th February, 15th-22nd February and 15th-22nd March. For more details on the itinerary of each trip, do check out our Trip Notes for each holiday. As with any of our Classic Cols holidays, these trips really do offer you complete flexibility so are perfect for mixed ability groups or couples – you really can choose to cycle as many (or few) miles as you’d like on a day-by-day basis. On a Marmot Tours Classic Cols holiday, you’re never under pressure to ‘keep up’ with the front of the group, nor would you ever have to ‘wait’ for the slower cyclists at the back. Having two guides and two support vehicles on the road at all times allows you to hop in the van if, for example, you feel like a breather or you don’t fancy a descent. Want to give the legs a rest after a tough day? Chill out at the hotel pool or hang out in the spa for a day. It’s your holiday, your ride and we’re there to help you realise your goals and make it the best cycling experience it can possibly be. All you really need to think about is turning the pedals. Whether it’s Gran Canaria or Tenerife you choose, we hope this has given you a flavour of what you can expect cycling with Marmot Tours on both islands.